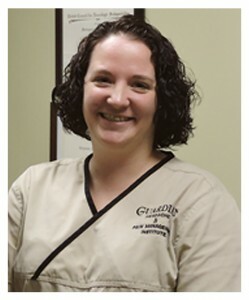 Kristi Chioni FNP-BC joined Guardian Headache and Pain Management in 2014 after graduating from Olivet Nazarene University with a Master’s degree in nursing. She is certified by the ANCC as a family nurse practitioner. Her background includes a Bachelor of Science degree in Biology from Eureka College and a Bachelor of Nursing degree from OSF St Francis College of Nursing. She has been a nurse for over 12 years in the surgical intensive care unit at OSF St Francis Medical Center and the emergency room at Advocate Eureka Hospital. Working in collaboration with Dr. Taimoorazy, she is trained to assess, diagnose, and treat many chronic painful disorders in a compassionate caring environment.